Although knowing virtually nothing about this project (including even the country of origin), it is again a case of Unrest Productions showcasing young projects who are effectively the new guard of the post-industrial underground. 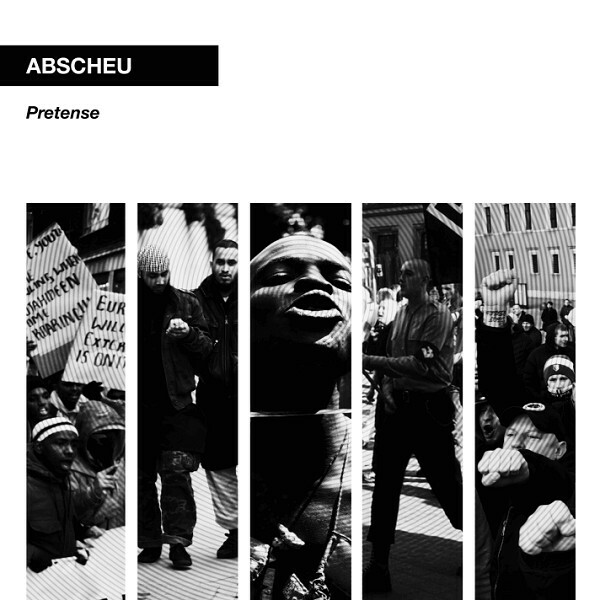 Pretense is the second release from the group, following 2016’ Breviary Of Chaos tape, and while having missed out on the debut, this functions as my introduction to Abscheu and can be quickly heralded as a stellar release. Although billed as power electronics, the sound of Pretense sits in the militant tinged and industrial infused end of the genre’s sonic spectrum. Six tracks feature on the LP, where the material is framed around a clean and defined mix of scrabbling and unsettled loops, sustained noise, heaving bass thumps and spoken, sonic treated vocal proclamations. Broadly the sound is stalking and controlled rather than pushing towards unbridled aggression, although the material does build up toward the final title track, which also includes some strong dialogue samples to flesh out the album’s concept *. Given its thematic focus and militant/ tactical sound, an oblique comparison could be made to Genocide Organ’s Under Kontrakt album, albeit here in a more streamlined and direct style. Either way this is a clear indication of the strength of Abscheu’s sound. Visually speaking, the clean design of the cover illustrates cultural conflict and societal unrest from differing angles, but without lyrics of further detail being presented the listener must engage in detail with the release to better appreciate the themes on display. Without question this is another outstanding release from the Unrest Productions stables and again highlights the label as the current leading underground outlet for uncompromising and expertly executed material. * – the promo blurb further expands on the concept: “From Europe to Middle East via Sub-Saharan Africa, Abscheu have been watching some of the most determined acts of violence. Studying how bloodthirsty groups wash their hands by adorning their motivation with divine command. Seeing zealots justify murderous wrath by invoking their favorite sacred book whenever necessary. A self-proclaimed court where justice is selectively rendered. A confusing purgatory where hatred is given a legitimacy. A sneaky trickery designed to mislead one’s enemies in the maze of one’s lies. «Pretense» is the exploration of that system from various perspectives. «Pretense» is an unquestionable judgment before men – definitely not before that thing they call god”. 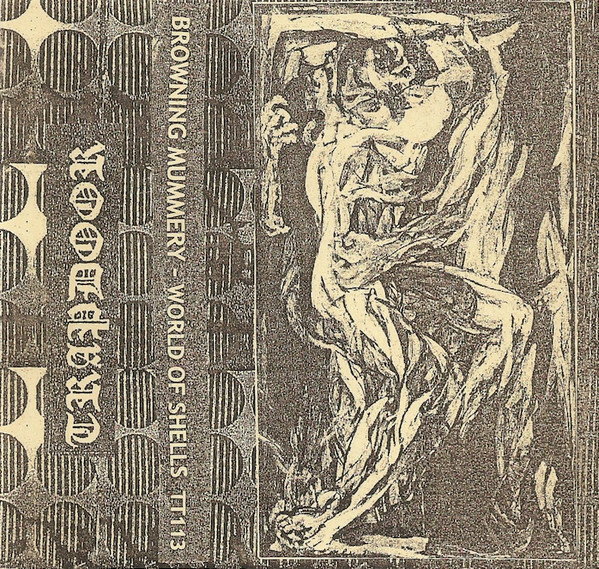 Browning Mummery are a long standing and somewhat obscure Australian experimental/ industrial project whose activities dates back to 1983 (including a couple of early tapes issued on the cult Extreme and Zero Cabal labels). Being primarily the creative vehicle of Andrew Lonsdale, the lineup has also sporadically featured the late John Murphy, in addition to the contributions of many others over the years. While not having been necessarily the most active project (and there seeming to be a gap of activity between 1996 and 2008), World of Shells arrives five years after the last full length, and was recorded in 2014 as a collaboration between Andrew Lonsdale and Yvan Volochine The tape features four lengthy compositions to span around an hour of material, where the sound covers some diverse sonic scope within a broad experimental industrial style. Predominantly the sound of the tape features deep cavernous tones framed around layered washes of muted industrial distortion. Being mid-paced and slightly muted, the tracks surges forwards with idling/ misfiring machines, squiggly sonics and a decent amount of ‘creak, crunch and clang’. By being meticulously layered, there are a multitude of sounds and textures to focus on throughout, and while loosely structured there is still clear composition as play (including some disorientating left/ right channel panning and wonky mid to high toned whistling sonic treatments). Of note, the third track Fibroscan 1 deviates from the rest given it is more meditative drone in execution, where some playful disorienting sonics build to a muted rhythmic thrum and the material coalesces into headier territory. While not being overtly dark or morbid in tone and quite playful on occasion, World of Shells wears an ‘experimental industrial’ tag like a badge of honour in delivering a worthy release. As per the title of the tape, this is a live set which consists of five distinct tracks spanning around 30 minutes. Crude and back to basics power electronics is the name of the game from this Finnish project who I have not checked out before, despite them being active from around 2004. In general terms loose rumbling looped structures act as sonic bedrock, while the vocals are spat in an agonised roar and heavily echo/ flange treated to create a result quite reminiscent of those vocals of Survival Unit. Likewise with its thick grinding industrial debris, hollow tonality and repeated semi-buried samples also reminds (positively) of The Grey Wolves approach to lofi industrial noise infused power electronics. As for the recording the sound is raw and slightly distant in feel, which I am not sure if this is down to the recording or is perhaps representative of the live venue sound (as I understand it the venue it was performed in is in fact a metal shipping container, which would no doubt impact on any live sound created and any recording made thereof). Regardless, the sound is still hefty and thick, with the mood being one of subdued anger with occasional aggressive outbursts (i.e. vocals). Overall this live tape is no frills and lofi, but definitely to the point, and very effective for it. Knowing virtually nothing about this project, it seems they are more commonly known as K.O.P., where the three letters are variously used to stand for different interchangeable phases (as per the protocols established by early industrial pioneer SPK). From what information there is available, K.O.P. is a Japanese project active back in 1988 when the first tape was issued, and with a further six tapes, a 7”ep and CD issued through to 1993 before the project disappeared. Now some 25 years later the project has returned with new recordings dating from 2015-2017. Having not heard earlier material from the project, I can comment on how this sits as a ‘comeback’ recording, but from listening to this the sound is rough, chaotic and crude in a general noise/industrial style, but also leaning more towards a nosier aesthetic. 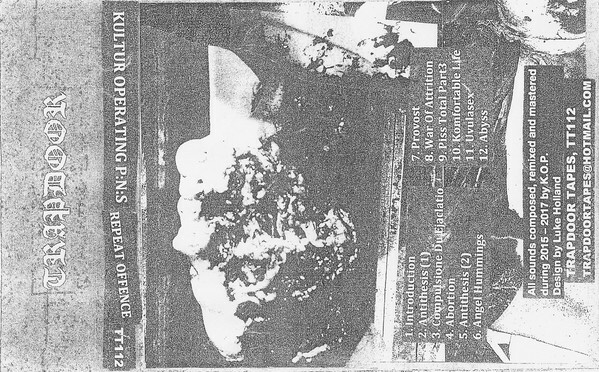 Twelve tracks spanning around 45 minutes of material features on Repeat Offence, where Some tracks are based around fiercely raw and chaotically overblown distortion which is staunchly analogue (perhaps derived from junk metal sources?). Conversely other tracks are of an apparent digitized source and rapid-fire style, with a clean and sharp sonic tone. Yet to speak of unifying elements, the mood and feel is chaotic and choppy throughout, and where there is limited overtly rigid structure, rather being freeform and amorphous and where tracks abruptly cut out before lurching into the next piece. With myself personally not being an avid noise listener, it is those compositions which slightly dial down on the higher pitched and harsher overblown textures which (for me) work best (such as the ambient noise mixed with radio chatter which closes out the tape). But equally that description alone will give a clear idea of whether Repeat Offense is right up your ally. 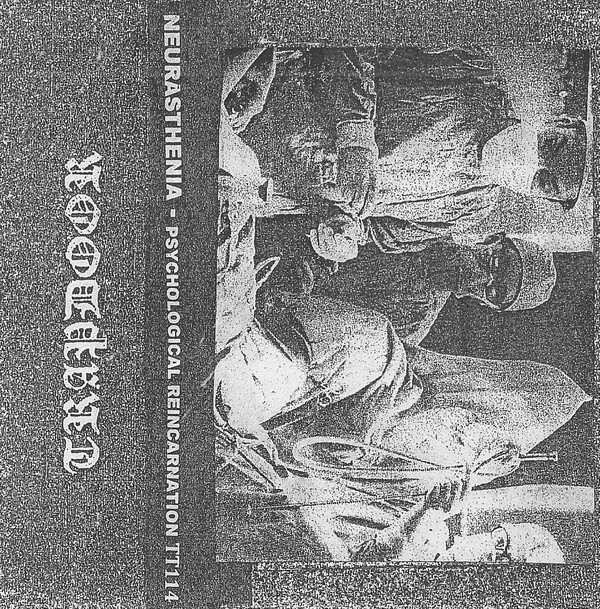 Neurasthenia ‎is a new Japanese/ Australia collaboration born out of a recording session when Luke Holland (of Armour Group, Mshing, Word Of Life Church SS, Trapdoor Tapes etc.) and Tom Miller (of Word Of Life Church SS, Psychward etc.) toured Japan in September, 2016 and met up with Hiroshi Hasegawa (of C.C.C.C., Astro, Mortal Vision, Nord). According to the notes on the cover, the two tracks on this 60-minute tape (one lengthy track per side) were recording live in a single take and delivers a solid dose of archaic industrial noise. The title track features on the first side of the tape and steps through a number of distinct passages. Commencing with detailed dynamic noise and spitting/crumbling static, the mood gradually moves towards a passage of hollowed out industrial rumble and the inclusion quasi ritual elements provided by junk metal clatter. Later segments feature crude loops and sparse crumbling textures which resemble the distant thunder of heavy waves. Cardiac Neurosis follows on the flip side and is a more subdued and controlled offering. Initial segments are sparse and cavernous in tone and complimented with ritual chimes, before a rough base of sustained and modulated ‘catacomb’ distortion is set down and gradually tweaked and twisted. Late sections are further augmented with radio frequency type scanning noise and garbled semi-buried vocals, before ramping up to more chaotic and forceful intent in the final segment. Given the ‘live in a single take’ method of recording, based on the end results it appears there would have been some clear discussion and pre-planning, as this sounds to be much more than a basic improvised session and particularly given its careful balancing of chaos and restraint (and being able to strategically pull back on the harsher elements throughout the tape for added sonic impact). So, all in all Psychological Reincarnation is a convincing and enjoyable tape in a style which radiates a sound of decades past than anything remotely modern.